Students at the Power Up! Divest Fossil Fuels convergence. The second day of the Power Up! Divest Fossil Fuels convergence at Swarthmore College featured strategy sessions and breakout caucuses. A sense of urgency was palpable throughout the heated workshops, discussions and panels held and the shape of a truly cohesive movement began to take shape. An afternoon panel highlighting activists from frontline communities—those impacted everyday by fossil fuel extraction, processing and use—was a powerful demonstration of the communities the divestment movement seeks to work in solidarity with. Crystal Lameman of the Beaver Lake Cree Nation in Alberta, Canada, Yudith Nieto working with the Tar Sands Blockade in Texas, Junior Walk of the Coal River Mountain Watch, a Pennsylvania anti-fracking organizer named Deirdre and Michael Bagdes-Canning of the Marcellus Outreach Butler in Pennsylvania all told powerful stories of the their communities. Stories of illegal privatization of First Nations lands, the effects of strip mining in Appalachia, water resource depletion and contamination with fracking fluid, and the very real health issues faced by these presenters, their friends, their families and their communities struck a chord with many, if not all, the students in attendance. This newfound resolve was reflected in the words and ideas expressed during a session late in the afternoon, where small groups of students wrote down and then shared their visions for the movement. Organizers plan to consolidate the visions, finding common ideas and themes, to present to all attendees. During a “shout-out” period at the end of the session, students were asked to share their most important ideas, some of which were: working in solidarity with frontline communities, the recognition of divestment as just one tactic to achieve larger climate justice and social justice goals, organizing regionally and nationally, and setting clear short-term and long-term goals. 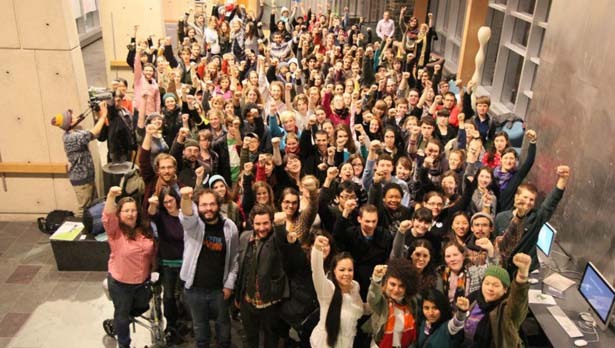 The keynote speechs that night helped to bring larger context to the formation of divestment campaigns. First Nations activist Lameman’s call for solidarity with the First Nations lawsuit against the Canadian government, which would invalidate 17,000 land leases on native lands. deepened students’ resolve to address larger justice issues. The Nation’s own Aura Bogado brought the larger idea of “climate debt” to the table, wherein the people of the Global South have a right to hold the Global North accountable for its abuse and overuse of global resources and atmospheric emissions. And finally, Ellen Dorsey of the Wallace Global Fund offered the story of her own involvement with the successful campaign to divest from South African apartheid in the 1980s, and how her foundation has successfully divested from socially irresponsible industries while still making a profit—and reinvesting in environment-oriented projects. As students wrap up their work on Sunday, including a direct action on Swarthmore’s campus, a clearer vision of the student-led divestment movement, itself part of the larger climate justice movement, is beginning to form. Caitlin KidderCaitlin Kidder is a senior environmental studies/international relations major at Mount Holyoke College in Western Massachusetts. She is a student organizer for her own school's divestment campaign, and is actively involved in the food justice and climate justice movements.